The 1996 Constitution states that the Bill of Rights is the cornerstone of democracy in South Africa and that it enshrines the rights of all people in the country and affirms the democratic values of human dignity, equality and freedom (section 7). The Constitution provides that the Bill of Rights applies to all law and that it binds natural and juristic persons to the extent that it is applicable (section 8) and that the courts must promote the spirit, purport and objects of the Bill of Rights when interpreting legislation and when developing the common law and customary law (section 39). The relationship between the Bill of Rights and the development of private law is complex and contentious; some commentators are sceptical towards what they refer to as the constitutionalisation of private law and would restrict direct influence of the Constitution on private law to the minimum. According to their view, reforms that are required by post-apartheid transformation should be effected by legislation or constitutional remedies (including legislation to abolish apartheid laws), while further amendments to the common law should take place by way of small, incremental developments according to the ‘normal’ logic of uncodified private law. In effect, case law has shown that this could leave the larger part of the common law unaffected by reforms, unless a particular principle or institution of the common law is directly or indirectly in conflict with the Constitution. Other commentators disagree with this approach, arguing that the large-scale social and political reforms foreseen and required by the constitutional transformation of South African society, combined with the fact that the apartheid regime was totally discredited, indicates that the Constitution intends to bring about and inspire wide-ranging changes in the law and in social arrangements, which must have a fundamental effect on private law. In this perspective, the common law cannot be left entirely or even largely untouched by post-apartheid transformation. As far as property law is concerned, it is clear that the new constitutional dispensation brought about by the 1993 and 1996 constitutions must have visible and lasting effects on private law because of the effect that apartheid land law had on widespread social and economic marginalisation and poverty. The substantive social and economic reforms foreseen by the new constitutional order can only be realised if reformist goals and norms find expression in the rules and practices of property law. Legislative reforms have to play a large part in this process, but legislation cannot do all the work and therefore judicial and doctrinal development of the common law and customary law is equally important. It is therefore necessary to consider the direct and indirect effect and the implications of the Constitution for the whole of existing property law, including uncodified common law, case law and legislation. Juta’s South African Property Law Libraryis aimed at revisiting and reassessing the whole of South African property law, including the uncodified common law that is mostly embodied in case law and academic writing, in order to establish how each aspect of property law was influenced by apartheid law, how it responds to the new constitutional dispensation (including land reform), and whether it could make a contribution towards the transformation of South African law and society. 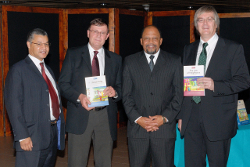 For this purpose, the South African Property Law Library will eventually consist of a number of monographs, each of which is focused on one specific aspect of property law. A list of existing and future publications in Juta’s Property Law Library can be downloaded at the bottom of this page. 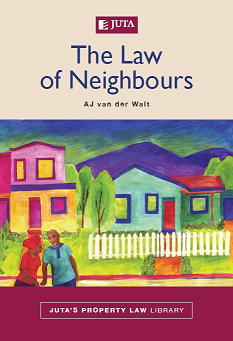 This volume is dedicated to the law of neighbours and written from the perspective that reconsideration and development of property law, in and for post-apartheid South African society, require and imply a completely new vision of what it means to live together in an open and democratic society built on the founding values of human dignity, equality and freedom. Alternatively, click here to access the publication online. 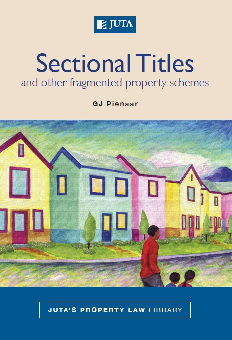 This volume is dedicated to the sectional titles and other fragmented property schemes and written from the perspective that reconsideration and development of property law, in and for post-apartheid South African society, require and imply a completely new vision of the value of fragmented property holding in the new democratic society in South Africa. 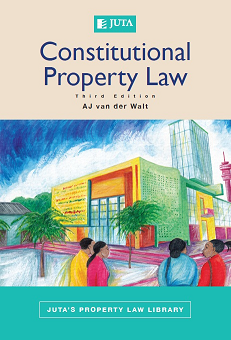 This volume on constitutional property law is an updated third edition of an existing book with the same title, now published as part of the series. The book analyses the meaning and role of the property clause (section 25) in the Constitution against the background of the Constitution’s reformist agenda and transformative goals. It also analyses the requirements for deprivation of property and expropriation, with reference to South African and foreign case law. The interpretation of reformist property law legislation and the development of common law property principles and institutions are discussed against the general backdrop of the new constitutional dispensation. This new edition of Planning Law reflects the major changes that have taken place over the last decade and it has been revised, enlarged and entirely reworked for publication in the series. It gives detailed attention to the core of planning law that comprises spatial planning, land use management and land development management. It introduces some basic principles, addresses the roots of planning law in South Africa as well as some of the results of apartheid history and the prospects of change in view of the new Constitution. 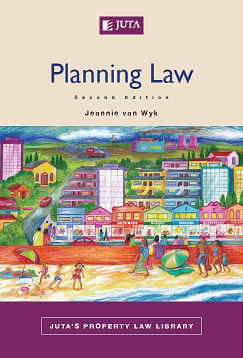 Since planning law is multi-faceted, the book also deals with related administrative, environmental, local government, housing and informal settlement issues. The relevant legal principles and legislative provisions are amplified by discussions of the major court decisions. 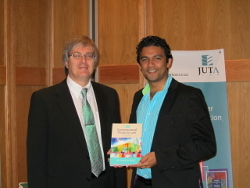 Juta’s Property Law Library Catalogue can be downloaded below.